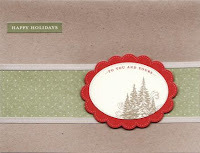 I wasn't sure what the Simply Sent card kits from Stampin Up were like, so I ordered one. 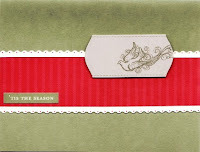 The card samples below are from the Handmade Holiday Card Elements set. 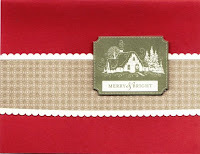 You get all the supplies to make 18 cards, 6 each of 3 designs. These couldn't be easier, all the elements you see other than the design paper and cardstock are stickers (the dove, the trees, the house, the scalloped borders), no stamping.